Slots.lv’s mobile casino is the perfect solution for North American players looking to take the excitement associated with playing in the casino wherever they go. Compatible with iPhones (version 3 and up), Android devices, iPads and tablets, the mobile casino offers players the chance to enjoy some of Slots.lv’s most thrilling casino games right from the palm of their hands. What’s great is that it’s so easy to get started and there’s no download required. All players need to get in on the fun are the funds in their account and they’re ready to go. Slots.lv’s mobile casino offers a growing assortment of games to choose from. The game selection includes some of the most popular classic and 3D slots, including Boomanji, Rook’s Revenge, After Night Falls and Cleopatra’s Gold. Table game players will be happy to find the classics such as European Roulette and Blackjack, along with a more modern version of Blackjack, known as Zappit Blackjack. Slots.lv is constantly looking to increase its selection of mobile games, so players should be on the lookout for new additions to the mobile game roster. Going mobile with Slots.lv is quick and easy. All players have to do is visit http://m.slots.lv, sign in to their account and let the endless casino fun sweep them away. If a player hasn’t yet become a member of Slots.lv, they can become one right from their mobile devices in a matter of minutes. As is the case on the website, players new to Slots.lv who wish to play from their mobile devices are eligible for both the $5,000 Welcome Bonus to play slots and the $1,000 Table Game Bonus. Slots.lv Mobile is easy to navigate and provides players with all the information they need concerning game rules, contact information, terms and conditions and the like. What’s more, players can also make deposits from their devices. To request a fast, guaranteed payout, players can either call in their request at 1-855-446-3770 or sign in at www.slots.lv and click the “Payout” button. The beauty of going mobile with Slots.lv is that it allows players to take the casino magic with them wherever they happen to be. Whether waiting in line, on vacation or at home, Slots.lv players can now enjoy their favorite games anytime, anywhere. Slots.lv rewards loyalty. With their better than ever MySlots Rewards Program, players can earn tons of points while having fun on all casino play. 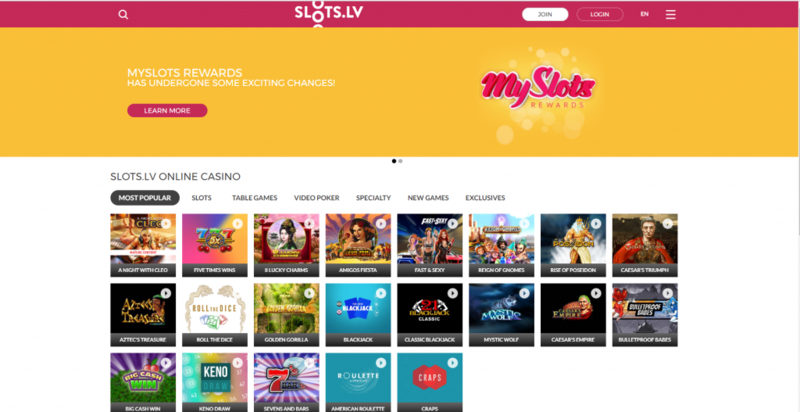 From the moment they make your first deposit at Slots.lv players will automatically be enrolled in the new MySlots Rewards. They can cash in or exchange points anytime, get cash back on losses and never lose their status. That means the next time they log in –whenever that is, their account will be as they left it. With Slots.lv the benefits, great games and offers never end! If you’re a cryptocurrency adopter then you will really dig their $7,500 in Bitcoin Welcome Bonuses, if not they still offer a very generous $5,000 in Welcome Bonuses. They have got nice promotions and interesting bonuses too, plus a generous loyalty program. Slots.lv is on the ball and really does everything to give players a variety of fun extras. The most commonly used banking methods with Slots.lv are Bitcoin, BTC Cash, Visa, Mastercard and gift cards but you are not limited to only these options, since they also offer options like Bank Wire, and Bank Transfer. Players can always call the Customer Service Team or simply start an online chat anytime to have questions or concerns addressed right away. Withdrawals couldnt be easier. Get your money in a few minutes when you use Bitcoin or BTC Cash. Bitcoin and BTC Cash are also the cheapest deposit option making it the best way to get your money in and out. You can take advantage of free Bitcoin and BTC Cash withdrawals and get your money even faster.